This is a credit card sized diagnostic kit for urinary tract infections. The technology is based on color changing polymers. USense allows for the visual detection of the presence of 4 specific uropathogens, including E.coli in just 30-60 minutes, a significant reduction from the time required for standard culture testing (2-3 days). 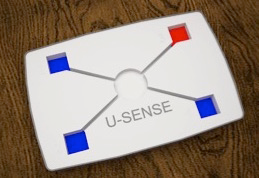 Moreover, USense can be deployed without needing a laboratory, trained manpower, electricity and easy to interpret results with colorimetric detection.